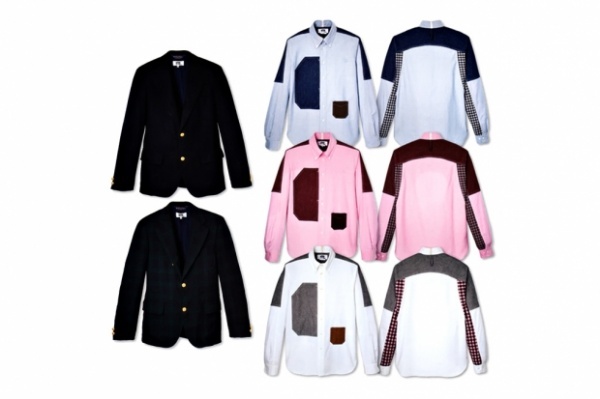 Created for the eYe COMME des GARCONS JUNYA WATANABE MAN line, Watanabe has taken two Brooks Brothers staples, the Oxford shirt and Brooks Blazer and has given them his own unique twist. The shirts have had one of the ever-present Junya Watanabe check designs applied to the underside of the arms while hits of chambray have been used across the shoulders and for the unique-styled front patch. The breast pocket, also created from chambray has been placed much lower and appears in a contrasting color. All these extra materials have been applied using a special triple-stitch technique. As for the blazers, check and solid colorways have been produced, sticking to the more traditional Brooks Brothers silhouette with gold buttons applied to give them that little something extra. This entry was posted in Blazers, Collections, Dress Shirts, Tops and tagged Brooks Brothers, Comme Des Garcons, Junya Watanabe. Bookmark the permalink.